I am interested in connecting with the Central Regional Group about a new and exciting Instructional Guide and some possible professional development workshops they may be interested in. I am not sure who to contact. Please advise. We all know how the tides come in and go out, just like fashion trends. The lesson here is, “hang onto it, it’ll come back in style!” This is also true with trends in education. Proficiency tests (1990s) became Graduation tests (OGT), which became “End of course” tests. (a.k.a PARCC and AIR) In our District, work with Professional Learning communities seemed to have begun almost 20 years ago, and waxed and waned with various administrations and their styles of leadership…..I remember working on a “Gold star” lesson with a colleague and thinking about the Rigor and Relevance Framework. (Daggett) Levels A, B, C, and D, quadrants on a grid, does that sound familiar? Sorry I am just getting back to this~ in the mean time, my mother passed away, I hosted two Chinese teachers for a week, we had my Mom’s memorial service, I traveled to San Antonio for a conference, and now I’m back! Wow, two months later, we are not looking at DOK any more. Oh well. What now? Now we are doing SMART Goals. Anyone else? (Feel free to reply to this blog or email me!) First of all, I didn’t know what SMART meant. Here’s what I found: LINK Another mnemonic device for me to learn. I like the idea of it, I like all of the things that should be included, but I’m having a hard time writing one myself that someone else will think is acceptable. So, I teach several courses that are not tested by any state tests, and the previous course scores might not even be relevant to the students’ achievement in my course. Algebra 2 students come from Geometry, where they took an AIRs assessment last spring. I have the data, but should it be anything I use to make predictions for my students’ grades? Typically, I have avoided looking back at prior data so that I wouldn’t judge students on anything but their current work. When I have a baffling case, I look back and try to gain insight into the student or the issue. Oh, I can write answers to each part of the mnemonic, but am I doing it “correctly”? After studying the graphs and transformations of sine and cosine curves, students will learn to calculate the parameters (a, b, c, d) that cause these transformations when looking at a graph. Honors students, grades 7, 9, 10 enrolled in Honors Algebra 2. We will do activities around this goal during the week of February 20. (or other times) This is a goal because student interest is high when we use real data and support it with our new skills. All students will have the skills needed to achieve this goal through diligent practice in and out of class on graphing transformations of the Parent functions. The motivation for the goal is to relate “textbook” math to the real world. This goal is related to future science courses where modeling data is important for making predictions and learning concepts. It is also aligned with student understanding of all transformations of functions, an emphasis in Algebra 2 and Precalculus courses. What do you think? (insert emoji with gritted teeth) Feel free to critique, I am open to input! Solving the first pair of equations we got h1=4r3. The second pair yielded h2=4r. After that minor struggle for the day, I waited until the next class for us to continue the problem. I posed the question, what if I want that volume to be a specific number? We decided upon 150 mL as a “nice” number, representative of a small amount of liquid that I might want to give away as a sample of my new perfume! (fake news) Most students knew that 1 mL converted to 1 cubic centimeter, so our measurements would be in centimeters. They set about solving a new problem, like 150 = 43r3 to get r = 3.2961. Now, it became easy to find the heights, since we had just solved for h1 and h2! So, h1=4(3.2961)=34.3948 and h2=13.1844. A ha! Now, I query, which one of these shapes would be the most cost effective in terms of a “product giveaway”? (material needed to fabricate it) I asked the kids to go home and calculate the surface area of each shape. In the meantime, I asked the Robotics / Computer science/ CAD teacher and 3-d printing Ninja Ryan McMonigle if he could have a student make these objects for me with our constraints. Very cleverly, he even asked if I wanted the dimensions of the inside of the figures or the outside to match our numbers. Wow, I never would have thought of that! It turns out that the student who made them was one of my own students from a different class! It took a few days, but he did it, with his own modifications. He left the cylinder open so that we could pour water into it, he left the cone open and gave it a base to stand on, and the sphere has a tiny hole that probably could use a bigger drill bit to open it up some more! The sphere also has one “flat” side so that it sits still on my desk! (aren’t they pretty?) The students discovered that the smallest surface area would be the sphere. Rumor has it that is known already by everybody but me. But it’s cool that the kids figured it out. Mr. McMonigle encouraged me to utilize his students’ skills again if I could….I actually did last year, too. Here is a mini story about that: I was getting ready to do a presentation about some of my favorite real world problems, including one about the safe angle at which a ladder should be leaned against a wall. I really enjoy this lesson in class because I send out a teaser to the kids the night before: a video from OSHA about ladders in the workplace. The kids have NO idea what is going on! The next day, I send them a TI-nspire document with an interactive graphic of a sliding ladder, and the angles at which it is leaning. I ask them to slide it back and forth until they come up with a “range” of safe angles. After that, I wish I could have the students interact with a real ladder, but I think it’s against a rule somewhere. I wasn’t allowed to do it at the presentation in a hotel/conference center, either. I guess nobody wants a lawsuit. So, I bought a mini ladder online that comes from a set of WWF Wrestling dolls and accessories. But then I wanted another. So I asked a student to make one for me on the 3-d printer. I guess it was a stretch for this kid to do it, and he tried very hard. When he brought me his finished product the day before I left for the conference, he was a little embarrassed, but I was so proud! I showed it around during the presentation, and gave it away to a teacher to take home. The question I posed was do folding ladders come at a pre-determined safe angle? Extension ladders must be placed against a wall or surface at a safe angle by the human who wished to climb it. I have several pictures from my summer Mission Trips where kids are up on ladders at a worksite, and I am responsible for their safety. We “measure” the slope and angles using the TI-nspire calculators to determine if the ladders are safe. I will continue to use my mini ladder and the technology to engage students (or teachers) in this “real world” activity. I decided to make the lessons a little more interactive this year, to display the "American style" of teaching and learning. I felt that I had to prepare some materials ahead and take them with me, in addition to packing supplies that could be used for activities "on the fly". My first activity was the Box Volume problem from Algebra 2. Every pair of students was given a piece of centimeter grid paper, and asked to cut out a specific square from each corner. (of course, I left the pretty neon paper at home and had to settle for local, recycled paper!) Each pair then folded up the sides to create the open box, and calculated the dimensions and the volume. We put all of the class data on the board, and then I also entered it into my Ti-nspire calculator on the projected touch screen. (sort of a Smartboard) We all agreed which box seemed to have the greatest volume, but they didn't know how to answer more specifically what the dimensions would be of the absolute MAXimum volume. Using scientific calculators, I imagine they would do some guess and check for a while until their teacher was satisfied that they had gotten close enough. I used the technology to show them how the graph can be analyzed to find a very accurate maximum ordered pair. We had fun discussing the quite different shapes of the boxes, and how certain boxes would only be good for storage of certain items such as pencils or erasers. The very flattest box was called a tray. Students were working on their English conversation skills at this point which was very engaging for them all. I never thought I would be teaching math in China! Last June, I had the opportunity to go teach in China for a couple weeks, and I took it. In the heat of July, I was there. My colleague (an American History teacher) and I met together, and planned some activities for teaching English, then we each did our own planning in our subject areas. I had to plan enough material for teaching 10-12 two hour classes, without knowing whether I would have internet access, a SMARTBoard, or access to copies! I knew that it could mean being "stripped" of the many luxuries of teaching in my little bubble of the world in Room 221 in Northeast Ohio, USA! What have I gotten myself into? My math lessons included topics such as equations, inequalities, systems, trigonometry, congruent triangles, sequences, and polynomials. The students seemed to be the equivalent of my sophomores back in the USA. They were excited to hear me teaching in English, and to assimilate what they already knew about each topic. Of course, there were things that were simply translation issues. (including my jokes!) We used translators to help, but discovered that often an English word and a math word don't translate very well! Another thing I knew I couldn't use was "American shortcuts" such as FOIL, that only work if you think/speak in English. I'm not sure the students knew the word "Distribute", but they knew how to do it. One day, I decided to do triangle congruency with them. No problem, right? The students knew each of SAS, AAS and ASA very well. All of a sudden, we came to a few right triangles and they used HL before we even discussed it....they didn't know what H or L stood for, but they knew that the logic of the proof was correct. When I introduced the words hypotenuse and leg, there was a unanimous "Ohhhhhhhhhh" to express their understanding of the method of proof. Enlightening. After a day with the Unit Circle and some basic Trig (again, skipping the SOHCAHTOA mnemonic), I moved on to using the reciprocal functions of cotangent, secant, and secant. The students had never heard of these! What? I guess they are truly not necessary, since you can always change the problem into its reciprocal and solve it from there. But what about the graphs? I thought it was worth playing around with, so we did graph them one day. I liked to think that I actually "taught" some math to this group of students! And it didn't really matter, because it wasn't on any test for them, and I wasn't giving them a grade. Let us not forget, that one of the best parts of teaching is the different groups of students we get to work with every year or every semester. I had a group of 25 kids from China, who had dreams of coming to the U.S. for education in the next few years. I enjoyed asking them about their favorite movies, foods, and more. They were thrilled to ask me things about life in America. Unfortunately, sometimes those conversations turned to talk about drugs and gun violence. They wondered if I was afraid in my home, and if I would buy a gun. Discussions that would not likely take place in my classroom at home. I'm blogging today to let you know about a newly published article from the Ohio Journal of School Mathematics. Catherine Lane from Baldwin Wallace University has written a remarkable article, "The Joy of Following Students Down Unexpected Paths." The article documents Catherine's experience when she decided to let her students think and reason mathematically FOR THEMSELVES (imagine that! An all-too-rare occurrence in many classrooms, right?). As you read the article, you'll be struck how students will take unexpected paths, and how letting them do so---even when working with the most familiar of tasks---can lead to surprising connections. In this article, Dr. Lane describes new paths her class took to generalize the sum of the interior angles of convex polygons. Check out the article here. Share it with your friends and fellow teachers! Spread the word about the excellent ideas of our Ohio teaching colleagues! What are the next 3 terms in this sequence? The Ohio Journal of School Mathematics has just posted a newly published article, What Are The Next Three Terms In This Sequence?, by Janet Walker and Matthew McBurney of Indiana University of Pennsylvania. Here's a link: https://library.osu.edu/ojs/index.php/OJSM/article/view/5816. The authors explore a task that---on its surface---appears unremarkable. However, upon closer inspection (and with the help of some algebra and technology) yields some cool mathematics. Arguably more importantly, they illustrate the danger of assuming that routine tasks have only one solution. Global Math Week! Exploding Dots! October 10 - 17, 2017! Coming in October… Global Math Week! The Global Math Project aims to engage students and teachers around the world in thinking and talking about the same appealing piece of mathematics during a series of annual Global Math Weeks. Inspired by the work of code.org, which makes coding accessible for millions of students across the globe, the GMP team will share the inherent joy, wonder, relevance, and meaning of mathematics with students everywhere and create a forum for the global celebration of creative mathematical thinking. What Happens During Global Math Week? The very first Global Math Week takes place this fall. Beginning October 10, 2017, one million students will experience Exploding Dots, a popular topic developed by Global Math Project founding team member James Tanton. During Global Math Week itself, teachers and other math leaders are asked to commit to spending the equivalent of one class period on Exploding Dots and to share their students’ experience with the Global Math Project community through social media. Teachers can choose a low-technology presentation format by using downloadable pdf lesson plans as a guide. Alternatively, they can opt for a technology-intensive experience, developed by the Canadian education technology company Scolab, which will consist of a collection of visually appealing “islands” representing Exploding Dots topics. For those who wish to delve deeper, additional materials will be freely available on the Global Math Project website to support further exploration of place value, arithmetic algorithms, negative numbers, alternative bases, polynomials, formal infinite series, and more. Visit our website and explore the wondrous topic of Exploding Dots yourself. Then register to conduct an Exploding Dots experience with your students during Global Math Week. Encourage your colleagues to register for Global Math Week too, and to spread the word. Become an official Global Math Project Ambassador and help build participation by posting on social media and helping organize local events. Perhaps host an Exploding Dots training session for educators in your area. See mathematics like you've never seen it before and take part in a global conversation. 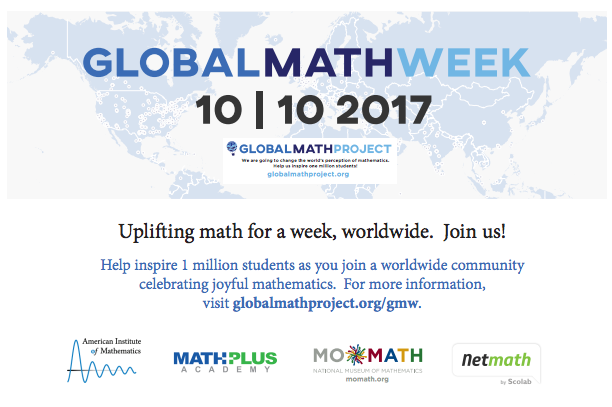 Get started at http://gmw.globalmathproject.org. In the Spring 2017 issue of the Ohio Journal of School Mathematics, Anne Berger discusses an exciting way to engage our students in conversation and collaboration while developing their procedural fluency and mental math skills. In the article, "Using Number Talks to Build Procedural Fluency through Conceptual Understanding," Berger describes her use of number talks to provide brief, daily opportunities for students to discuss, connect and develop their strategies for solving problems. Here's a video of children engaged in a number talk with a guru of the technique, Jo Boaler. Here's a link to the Spring 2017 Issue of the Ohio Journal of School Mathematics.